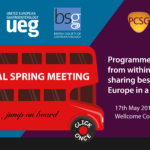 The European Society of Primary Care Gastroenterology ( ESPCG) is teaming up with the Primary Care Society for Gastroenterology (PCSG) in the UK to bring a mixture of ESPCG ‘state of the art’ gastroenterological knowledge and PCSG personal experience in IBD. Topics related to IBD and IBS will be presented from a panel of speakers. Case scenarios from practical practice situations as well as round tables will make participation and interaction possible. Both UEMS and RCGP accreditation is anticipated.